Astigmatism is a very common condition that makes it difficult to focus. 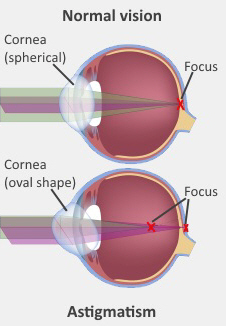 People with astigmatism have blurred vision because of the shape of the cornea or lens in their eye. In a normal eye, light focuses in one spot on the light-sensitive layer at the back, called the retina. This gives sharp, clear vision. In astigmatism, the light focuses on several spots, which means you see fuzzy, blurred images. Usually this happens because the front surface of your eye (the cornea) has an irregular or rugby-ball shape (called corneal astigmatism). Occasionally the lens inside your eye may be tilted (called lenticular astigmatism). Whatever form of astigmatism you have, things will appear fuzzy or shadowy. The picture on the right shows the difference between normal vision and astigmatism. Astigmatism can also happen with short-sightedness (myopia) or long-sightedness (hyperopia). Some people are born with it, but it can also develop gradually as you are growing.